Yesterday, after finishing my meetings with ample time, I decided to take a leisurely bus ride to the East End. I now realise that there’s an oxymoron in that sentence. Without a bus guru to hand, there is nothing relaxing about bus travel. Luckily, I spotted one nearly straight away (not just any old bus but one that was marked Old Street) and, without any thought, ran (difficult enough in heels) to the closing doors. Phew! As it crossed Waterloo Bridge, heading south, I knew something was wrong. I may have got the right bus route but it was heading in the wrong direction. By the time I changed buses, time was tight and I had to take a taxi from Old Street station in order to get to Flowers before they closed. Somewhat ironic that a taxi came to the rescue after all. David Hepher at Flowers. Own photograph. 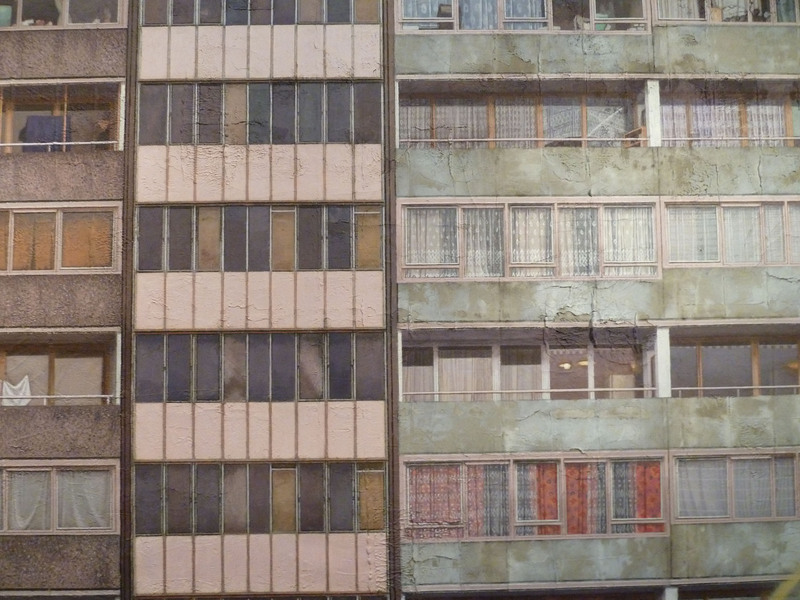 Flowers are currently showing a series of new work by David Hepher which explores the infamous Aylesbury Estate in Walworth, South East London. Crime, poverty and violence – the Aylesbury Estate is often used to exemplify all these things and frequently crops up in discussions about urban decay. Commenced in 1963 (and demolished in 2010), it was a vast mass of concrete, originally intended to regenerate the lives of the working classes of South London – another irony. Spread over a site of 285,000 square metres, Ayelsbury was the largest estate in Europe, intended to house approximately 10,000 people. Aylesbury remained stuck in time, the perfect showpiece of suffocating post-war planning. Aylesbury Estate before demolition. Image via www.skyscrapercity.com. Hepher’s interest in images of homes stems from the fact that a house is the first image a child will paint as a symbol of refuge and of safety. Now, he looks at how people are forced to live in different environments, raising questions about society and living conditions. He relishes the dirty personality of these council flats with their stained and eroded walls and their constantly changing appearance as people move in and out. Hepher is able to take something ugly and imbue it with a sense of carefully considered beauty. The façades may have once been uniform but by focusing on such detail, he refreshes these buildings, concentrating on individual sections. Using a close-up grid structure, Hepher exploits the angular architecture of the flats, creating a moving portrait of Brutalist architecture with idealistic scenes of escapism used to contrast the grittier surfaces of the buildings. In an attempt to capture the very essence of the buildings, Hepher mixes building sand with his oil paint to incorporate the fabric of the architecture in the works. This simple technique helps to bring the paintings to life. 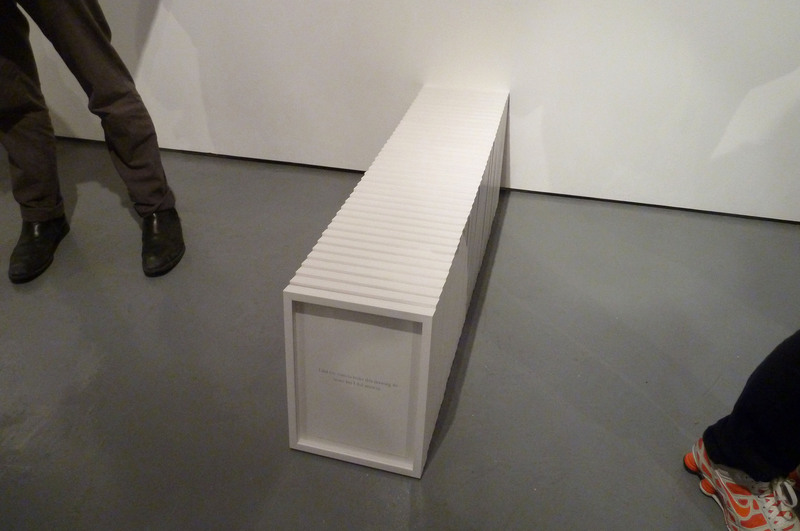 David Hepher, Aylesbury (Homage to Robert Gober), 2008-10. Own photograph. 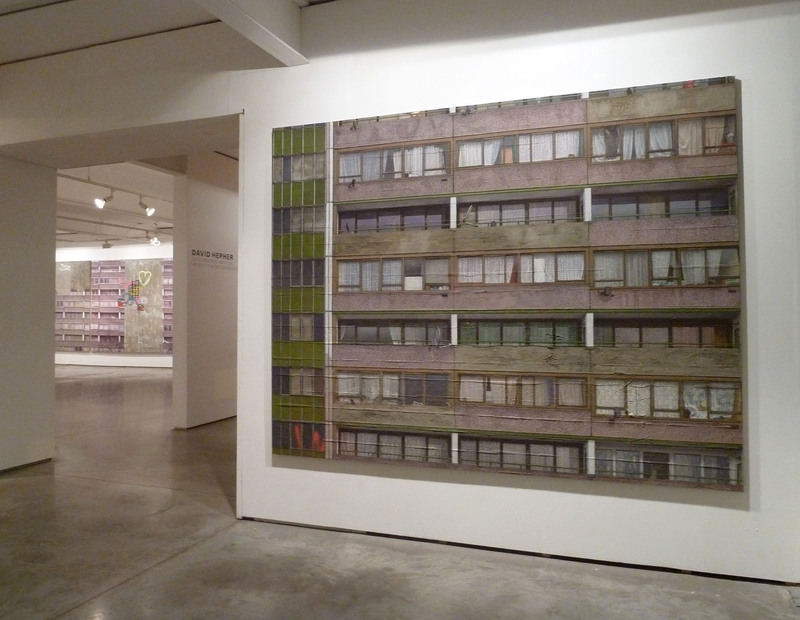 These works are an interesting combination of portrait and landscape; they show the immense scale of the Aylesbury tower blocks – one of the works, consisting of five canvases, is ten metres long. Hepher doesn’t paint Aylesbury because of the political or social connotations nor because the buildings have been branded ‘ugly’ but because he believes they were an impressive part of our landscape. Detail of a David Hepher work. Own photograph. Somewhat amazingly (considering my earlier slip up) I know parts of the East End well enough to go on foot and I headed round the corner to the Hoxton Art Gallery whose new exhibition Utopia plays with ideas from the seminal text by Sir Thomas More. Written in 1516, during the turbulent reign of Henry VIII, More’s narrator Raphael Hythloday describes the island of Utopia, that he believes to be the ideal human society. It appears that More himself didn’t actually believe Utopia to be the perfect society and its complex meanings are intentional. The book analyses More’s desire to create a perfect world juxtaposed with his realistic knowledge that perfection in mankind is impossible. This is not the place for an analysis of More’s humanist philosophy and ultimate religious martyrdom but the exhibition presents an interesting concept which is, here, explored by four artists. Their work couldn’t be more varied, although all are united by the theme of Utopia with a twist – Utopia filled with ideas of disruption and turmoil. Because, as More showed, Utopia cannot really exist. Stephen Dickie, The Mundaneum Debate, 2012. Own photograph. Stephen Dickie’s work looks at the ideas of intellectual utopia, exploring the different ways in which we pursue knowledge. His works appropriate structures and systems built to foster and preserve knowledge although the pieces of equipment he uses are adapted so as to become dysfunctional; broken cassettes sit atop a vinyl record emitting phonetic sounds which will, no doubt, drive the gallery staff mad by the end of the show. 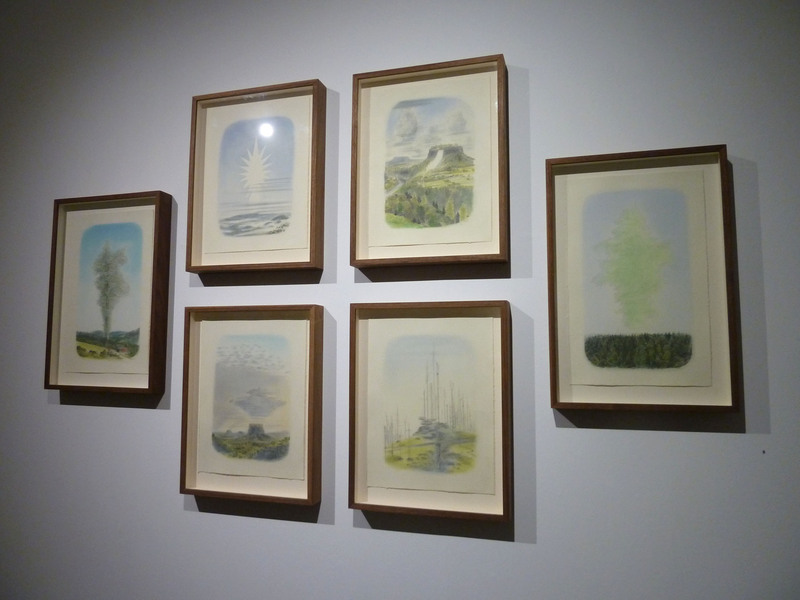 Wieland Payer’s drawings also stood out, representing distant and ethereal landscapes with peculiar misplaced figures. Payer seeks to portray nostalgia for a period of European Romanticism. Wieland Payer drawings series, 2011. Own photograph. This is a focused show with a very successful concept. I cannot say all the artists’ works appealed to me but the ideas behind them are certainly thought-provoking. 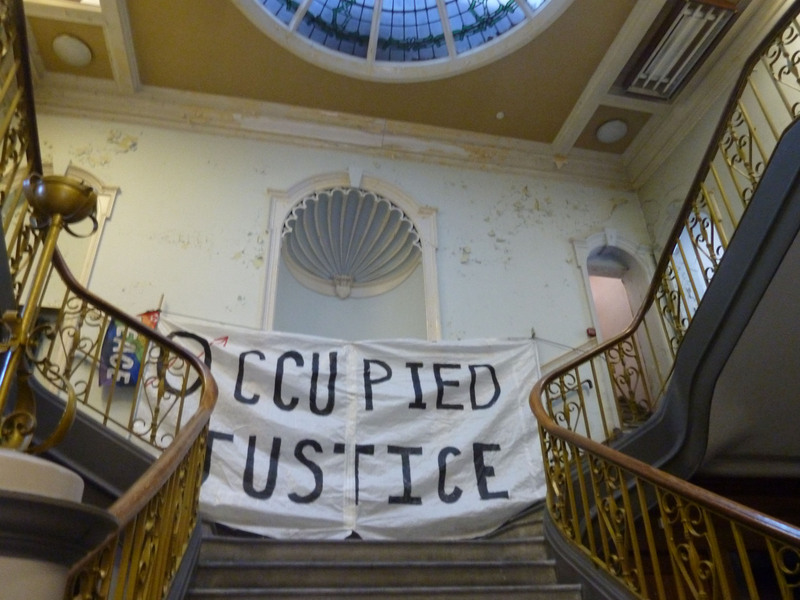 And, off I went again, past Shoreditch Magistrates Court (only last week occupied by the Occupy Movement who curated a brilliant sound installation in the dank cells) and Lounge Lover – it seemed as if I was doing a walking tour of the East End…in heels! Occupy at Shoreditch Magistrate’s Court. Own photograph. By now I was exhausted and my next stop, Annexe (part of the Brick Lane Gallery but, confusingly, not on Brick Lane) did not reward me for my crazily long walk. For me, Christopher Oldfield’s paintings were crude and lacked visual immediacy. They didn’t capture me and I didn’t need to stay. Christopher Oldfield, Paintings. Own photograph. Although I was shattered, I knew the rest of my list wouldn’t disappoint. The cabbie (yes, I did take another cab) didn’t really know where Hewett Street was but between us we worked it out and I was relieved to have a sit down at all those red lights. 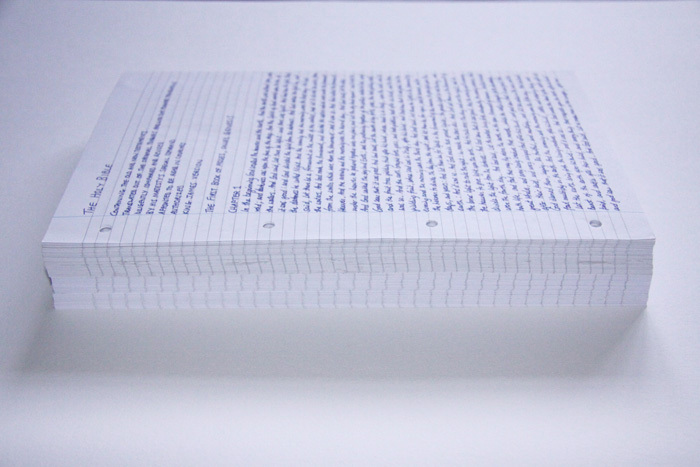 For the last 18 months, Daniel Rapley has been writing the King James Bible by hand, on standard notepaper, using a ballpoint pen. That’s 783,137 words. Sic is a labour of love. This exhibition alone made the disappointment of my trip to Brick Lane fade away. Rapley’s work is amazing – there is nothing else like this around. Daniel Rapley, Sic. Own photograph. While the rest of the exhibition is subtly lit, Rapley’s bible glows (a design conceived by curator, Michael Hall). The work is displayed in a case where only the top page is visible; you see one tiny fraction of this mammoth concept, this huge artistic undertaking. You have to have the belief that all the words are on all the pages – the same religious belief upheld by those who study the Bible every day is needed to view the work. This is an idea also played on in Forty where you only see the first of 40 identical drawings stacked against the wall. Much to the horror of those around him, one gallery-goer decided to flick through – it did allow for the non-believers to have a good look though. The work is about faith and its integrity is unprecedented. Daniel Rapley, Forty. Own photograph. You don’t have to be religious to understand this work. You certainly don’t have to have read, or know, the Bible. Sic is the visual manifestation of a private performance that requires the belief of the viewer. It is a covenant that questions conventions of artistic labour and productivity, of authorship and creativity. Daniel Rapley, Sic. Image via www.danielrapley.co.uk. 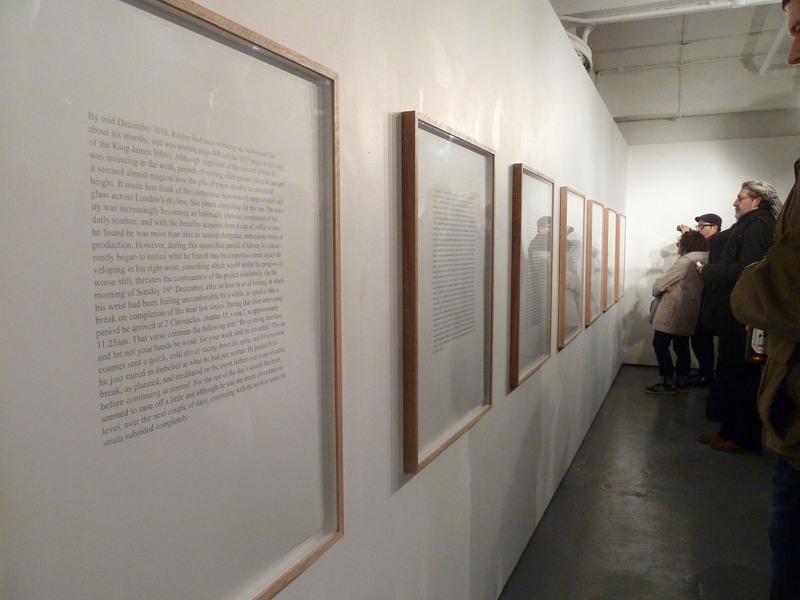 Alongside Sic, Rapley is showing seven large text drawings which he created during this labour-intensive project. These hand-drawn manuscripts describe the minutiae of Rapley’s life, brief bursts of inspiration as he painstakingly embarked on Sic. Daniel Rapley, Exigencies 1-7. Own photograph. Rapley is impressive and his work is refreshing; he has broken down the whole concept of religion into an intellectually sincere, thought-provoking piece. The spin-off works about his life are comical yet serious, equally clever and stimulating. The images don’t do any of these works justice and the pieces must be seen to be believed. Rapley’s dedication and focus must not be underestimated and this show is a must-see. Finally, we hailed a cab (yes, another one) and headed to the other end of Old Street to Cabinet (or Curtain as I keep calling it – I guess tiredness has a lot to answer for this week). 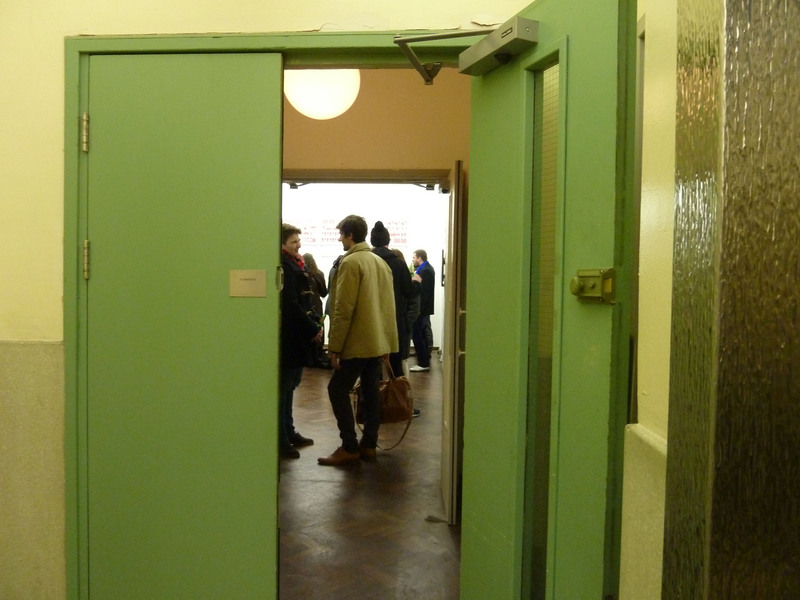 Having seen Cabinet at Frieze this year, I wanted to check out their permanent space on the ground floor of a block of flats – so discreet you wouldn’t have any idea that it even existed. Homo Economicus explores the relationship between art and labour through a study of the political economy. The term homo economicus posits humans as self-interested actors who have the ability to have make decisions to maximise situations for their own well-being. The works present an interesting discussion and breakdown of capitalist philosophies, visualising the role of economics in relation to art. 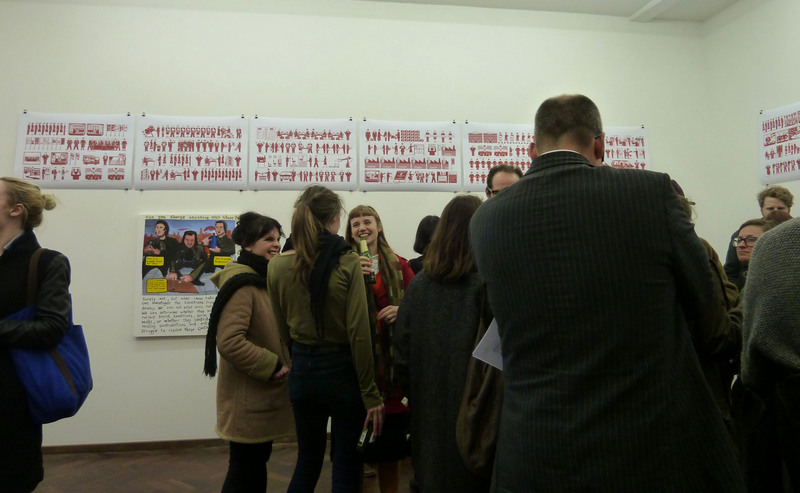 The exhibition is in two parts, the second of which can be seen at Mehringdamm 72 in Berlin. Together they explore the political consequences and resistances that this economic model can encounter and endure. Homo Economicus at Cabinet. Own photograph. After an evening of such varied and heavy concepts my brain was starting to spin. We walked and walked and walked, tripping and falling over cobbles along the way and finally collapsed at the wonderful Le Café du Marché to relax and warm up. 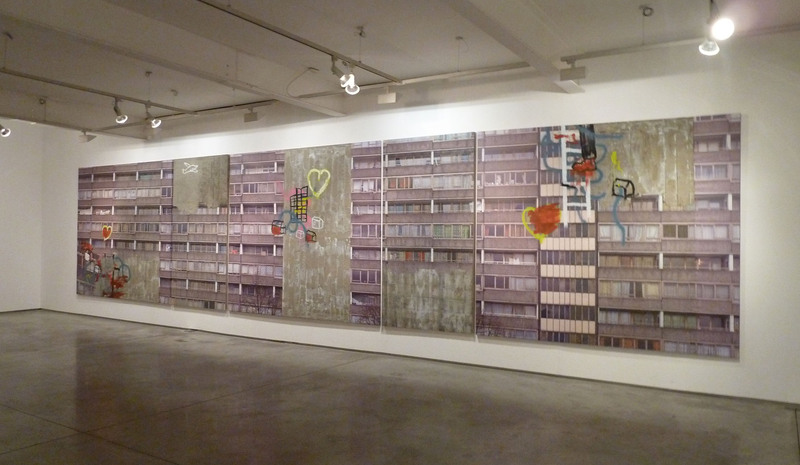 David Hepher: Lace, Concrete and Glass – An Elegy for the Aylesbury Estate is at Flowers, 82 Kingsland Road until 25th February 2012, www.flowersgalleries.com. 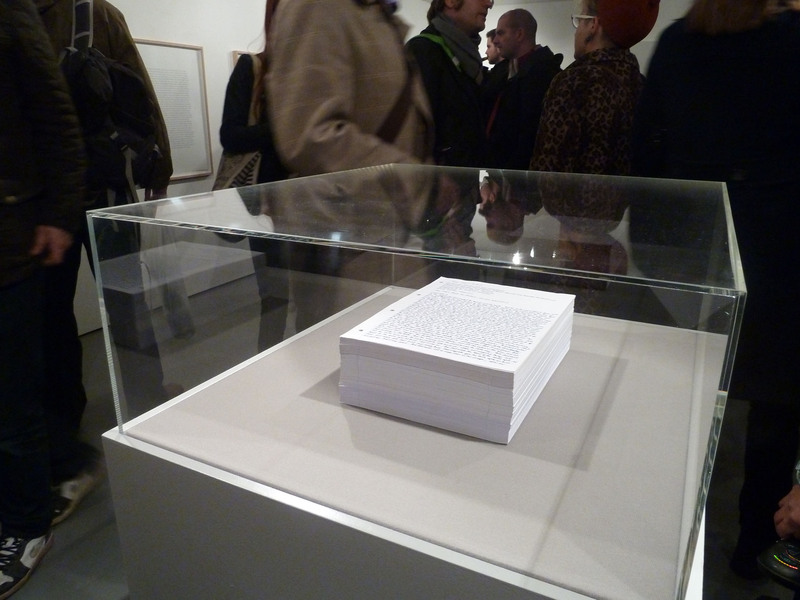 Utopia is at the Hoxton Art Gallery until 1st March 2012, www.hoxtonartgallery.co.uk. Paintings: An Exhibition by Christopher Oldfield is at Annexe until 20th January 2012, www.christopheroldfield.co.uk. 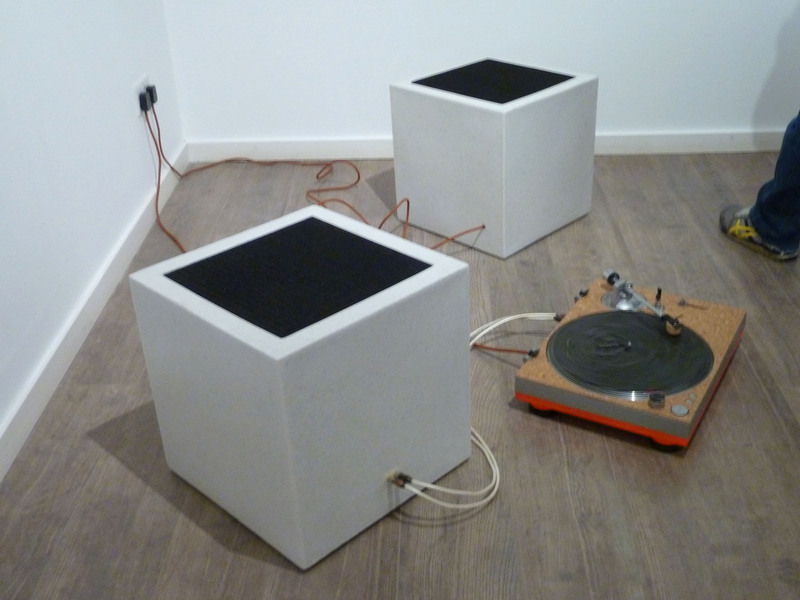 Daniel Rapley: Covenant is at PayneShurvell until 3rd March 2012, www.payneshurvell.com. Homo Economicus is at Cabinet until 3rd March 2012, www.cabinet.uk.com. Yet more interesting work about which most of us would otherwise not have heard. You’re welcome and I’m so pleased you’re enjoying the posts and finding them useful. Do keep reading and let me know if you get to any of the galleries yourself. I see you were on Sclater street yesterday as you visited The Brick Lane Gallery the Annexe. However, you completely missed my gallery, Tony’s , you must come back soon and see my current exhibition with the crochet street artist Olek. Will try to pop in when I’m next passing. Do keep me posted on your future shows. Thanks for your comment and for reading.